You may have heard people mention digital transformation. It’s the new darling of the digital world, but what does it actually mean? Let me walk you through the key principles and how they can be applied in the real world of business. Whether you’re a small business, not for profit or large enterprise, the principles can be applied even if the scale and challenges will be different. Let’s start with a definition…. “Digital transformation is the use of digital technology to improve operational capability in terms of accelerating technology performance, process efficiency and people’s performance through empowerment”. Enterprise transformation encompasses the entire organisation, taking an end-to-end view of how digital technology underpins and influences business strategy. This requires a comprehensive analysis of customer touch points and how technology should enable them, whether the tools you use are customer or internal facing. This is my definition. There are many others. Mine is based on practical experience doing this with organisations including House of Fraser (B2C) and Hansgrohe (B2B). 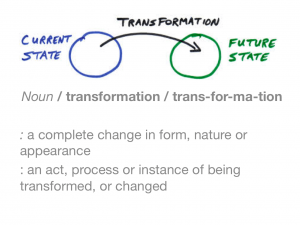 What is the difference between a digitally transformed and a non-transformed organisation? Global multi-channel retailer unable to realise its single customer view vision for improving customer centricity due to multiple disparate data systems not being effectively integrated. Phased migration to a cloud-based consolidated data intelligence solution, with an MVP focus on increasing customer insight for the Customer Service team to improve customer enquiry handling. Reduced call duration (cost saving) through better data access & improved revenue through the call centre via smarter campaign targeting. No, I didn’t just make that up! What are the principles and foundations of digital transformation? Let’s now look at what each pillar encompasses. The foundation of smart decision-making is customer knowledge. You need to know what customers think, what they need and how this is changing over time. You also need to understand the market in which your operate and how this is changing technologically, auditing competitors and looking to ‘related worlds’ for inspiration for how technology is being used for innovation and disruption. Transformation must be pinned to strategic goals. To ensure the technology solutions are aligned with the business, a clear definition of the goal to KPI path is required (goal – objective – metric – KPI – benchmark – target). With a clear understanding of your environment and goals, you can align digital activities and then prioritise based on an agreed prioritization criteria. Prioritisation must be mapped back to organizational capability to determine project phasing and resourcing. You need a company wide measurement framework to ensure the impact of activities is effectively measured and can be evaluated objectively against targets. People are the driving force for transformation; a tool without buy-in is an expensive failure waiting to happen. An ongoing programme of training and development is required to sustain activities and ensure progress is continuous. Things change, and fast in a digital world. Your project needs to respond to change and have regular reviews to ensure the priority focus is still relevant and aligned with your business strategy. I’d welcome the opportunity to talk you through my experience running digital transformation and strategy projects with clients including House of Fraser, The Wine Society and Joseph Joseph. I hope you found this useful reading.